A-LEAGUE: While the Roar's attack continues to flourish, coach Mike Mulvey heaped praise on his backline after Saturday night's 1-0 win over Perth. The Roar boasts arguably the best midfield in the competition, while up front Henrique and Besart Berisha have scored four and three goals respectively so far this campaign. While first-placed Brisbane's 15 goals are the highest in the league, the team has also let in a competition-best five goals from eight games. While a youthful backline, including Corey Brown, Jack Hingert and James Donachie kept a clean sheet against the Glory, Mulvey singled out the experience of skipper Matt Smith as being pivotal to the Roar's defence. Smith, 31, took a heavy knock late in the first half on Saturday night, but got back up and played out the game. Berisha sought him out after scoring, with a courageous sliding tackle giving the Roar possession and setting up the goal. "Matty is worth his weight in gold. He had three young fellas around him in the backline (against Perth), and he wasn't going to be outdone by those guys," Mulvey said. "They all pitched in together; they all did their jobs. Matty copped a severe whack when he fell. "But that's the warrior within him - he just got up and carried on with the game." While Smith is leading by example at the back of the park, Brown is giving his team an extra dimension in attack. He pushed forward often against the Glory and fired in some pinpoint crosses from the left flank. Mulvey faces some difficult selection choices leading into this Friday night's away clash against Adelaide United, as experienced left-back Shane Stefanutto (hamstring) should be available. "He (Brown) is coming of age. 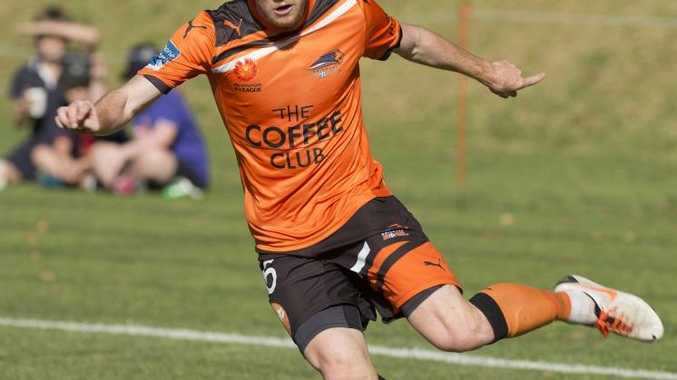 It's difficult to play for Brisbane Roar because there's an expectation, not just from the fans but from myself in regards to performance," Mulvey said. "He is maturing the same as Kwame (Yeboah)." Mulvey gave every indication Berisha will play another lengthy stint against the Reds, two weeks back from a hamstring injury. "I said to Besart at halftime (against Perth), 'get us a goal and we'll look after you and make sure you're ready for the next game'," Mulvey said. Also, goalkeeper Michael Theo (shoulder), Jade North (groin) and Liam Miller (calf) should be fit for this Friday night, presenting Mulvey with more options.